← Breaking News!! Kenny Offenther, as well as Stan. With five players of 16 from the Southwest Coast District, we stood an opportunity to do well. Our two ladies made us proud. Pam Nurnberger managed to win 18 of 21 games which makes her the 2018 Ladies Champion of the Masters. Playing out of Bradenton Shuffle Club, Pam served three years as First Lady of the district when her husband Ron was President. Congratulations, Pam! Second is Terri Smith, also of Bradenton Shuffle Club, who placed first in 2016 and 2017. Ron Nurnberger has reminded me that Southwest Coast District Ladies have placed first six years in succession and also 9 of the past 11 years, (six of which were Judy Taylor, now of Golf Lakes). No wonder other districts sometimes tremble when visiting this district due to our reputation. Third place was won by Debbie Norton of the Southern District playing in her first State Masters. Debbie won 12 games. Fourth, Helen Biaggi, also of the Southern District with 10 wins. Pauline Murphy, of the Central District also won 10 games. Katy Walker, Central District manages 9 wins, with Allie Enos of the Southern District winning 8 games. Nancy Myklejord of the Central District placed 8th with 4 wins. Joyce Smith, Southern District, served as Alternate. Our three men were not right at the top this year, but they played well also. First place went to Allen Dronsfield of the northern District with 16 wins. Second was Earl Ball of the Central District wiith 13 wins, followed by Jim Miller of Bradenton Shuffle Club with 13 wins (3rd due to the head-to-head rule, Earl beat Jim 2 of 3). Jim and Jo, a tournament director, are snowbirds from Northern Indiana, wintering in Pinecraft in Sarasota County. Michael Seyfer of Zephyrhills in the Central District placed 4th with 11 wins. Ron Nurnberger of Bradenton Shuffle Club and Past President of the SWCD, placed 5th this year with 9 wins. 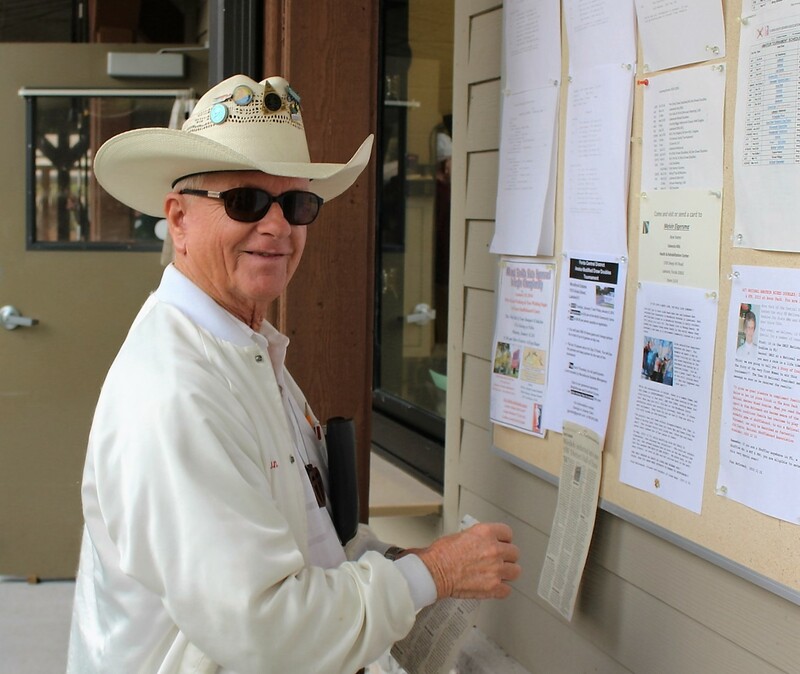 Dave Kudro, SWCD, Bradenton Shuffle Club and FSA President placed 6th with 8 wins. Dave spends a lot of time guiding our Florida Shuffleboard Association affairs, and is urging all of us to recruit new shufflers to join in Amateur play. Ken Offenther of the South East Coast District placed seventh with 7 wins and Dean Myklejord of Central District, also has 7 wins in 8th place. Steve Raimondi of Clearwater in the West Coast District served faithfully as Alternate and played the last day in place of Earl Ball. All these players deserve our respect as they had the most points all year in upper level FSA Tournaments, earning the right to play.
. The Southwest Coast District lost a well- respected member last week in the death of Paul Miller. Paul was a great shuffler until modern times when he suffered several health challenges. A native of Iowa, Paul worked in and around Pinecraft as an auctioneer and real estate salesman, was active in church and civic affairs, and lived a great life, setting a good example for us all. May he rest in peace. Our sympathy to Mary Miller and her family.
. Pat Tomko, Vice-President of Bradenton Shuffle Club advises that all shufflers are welcome to play at Bradenton Shuffle Club, Black & Yellow M-W-F during April 8:30 a.m. Non-members free during April , and if wishing to play May-Sept. may do so for $5 for the Summer.
. Summer shuffle is available in Indiana, Michigan, Ohio, Ontario, N, Carolina, and others if you hunt for them. This column will resume in October.